Learn how to download software for the iClicker student response system and integration files for the UC San Diego TritonEd learning management system. Select the proper software depending on whether or not you use TritonEd. Find out more about TritonEd LMS. 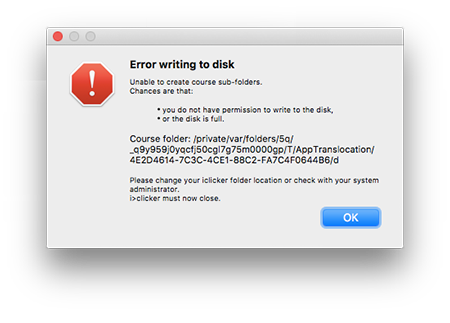 If you are on a Mac computer running Sierra or above and you receive an error similar to the one pictured below, you will need to follow the instructions in the next section titled "Download Latest Version with TritonEd LMS Integration files for Mac Computers Running Sierra or above." If you are downloading NEW iClicker software onto Sierra (or above), you must use the Mac OS version below. Double-click the .dmg file to mount it (it will appear like a removable USB drive on your Mac), create a new folder on your Mac entitled “iClicker 7” (or similar), then copy/paste the iclicker.app file from within the .dmg disk image into this new folder. Once you run iClicker from this new folder, all the supporting files and folders will be created as normal. In order for this new install to work with TritonEd, you will need to download the LMS_Wizard.xml file below. Right-click on the LMS Wizard and choose "Save link as..." to download this file to your computer. Pay attention to where it downloads because you will want to put the LMS_Wizard.xml file into the “Resources” folder of this new iClicker software. The Resources folder was put wherever you had the iclicker app when you first opened it. The iclicker software needs to be closed when you put this file into the folder, and the next time you open the iclicker software, the proper TritonEd information will be available when setting up a class. Learn how to load a class roster into iClicker. Get information about the TritonEd LMS. Download the Mac OS .dmg file from the appropriate drawer above to your hard drive. Double click the .dmg file to see the iclicker application folder. Open the Applications folder: from the Finder menu, click Go, then select Applications. Drag the iclicker folder into Applications. To avoid accidentally using the wrong files in the future, eject the disc image, and delete the .dmg file from your computer. To make iClicker available to launch from the Mac dock, open the iClicker folder from Applications and drag the file iclicker.app to your Mac dock. Download the Windows OS .zip file from the appropriate drawer above to your desktop. Open the file and choose to extract all files and select a location. We recommend extracting to a folder on your desktop (which is the default). To avoid accidentally using the wrong files in the future, delete the zip file from your desktop. Important: The Linux version requires super admin privileges to perform the initial set-up of the computer and does not support 32-bit systems. iClicker Classic for Linux currently only supports Ubuntu LTS releases listed. If you need help installing the Linux version, email clickers@ucsd.edu.